Are any of your tenants in violation of their lease? The Notice of Lease Violation (also known as a "Cure or Quit Notice") warns the tenants that they need to correct the listed violation(s) in order to bring their lease back into good standing. It is a serious looking document that identifies the tenants with social security numbers, the premises and the violation(s). Don't hesitate to notify your tenants that they are in violation of their agreement. Small problems can turn into big ones if we don't tend to them early enough. Whether your tenants have an unauthorized pet, unauthorized resident or neglected property condition, you must notify them of the violation. You may then have the option of enforcing any violation penalties you may have in your lease agreement. Some landlords even charge violation fees. That's up to you. In the event the tenancy goes sour, and you wind up in Landlord - Tenant Court, copies of any violation notices to the tenant may be relevant in enforcing your case. Remember to send official notices by certified mail and also by regular mail to tenants. Be sure to record the article # on the document being sent and on your own copy. 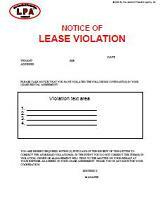 The Notice of Lease Violation is an excellent tool for enforcing your lease for maximum Landlord Protection.